» Forum » The Lounge » Arcade and video games » Any one have a successful Clay Cowgill Multi Jamma Setup? » Any one have a successful Clay Cowgill Multi Jamma Setup? Any one have a successful Clay Cowgill Multi Jamma Setup? Hey arcade people, I want some opinions and expertise before I scrap this project and sell the lot of Clay boards I have. I am using the Clay Cowgill Multi Jamma boards to switch between a few jamma boards I have in my SFCE cab. I currently have SFCE, and TMNT setup to play. You push the p1/p2 buttons at the same time, and it changes between the games. Its pretty neat. At one point, I had tetris in there as well, but it was causing an issue with TMNT where you couldnt do the two button special moves anymore. So I unplugged tetris, and that issue went away. Now, Im starting to have issues with my p1/p2 buttons. P1 seems to always coin up 2 players. I didnt notice this before, so Im not sure if I over looked it or if this was always an issue. It seems to only be an issue with SFCE, not TMNT. Does ANY ONE else have this multi jamma system? I feel like I am the only one. I never hear or see them any where but his site. I would really like to get all these games up and running, and also add the super dodge ball board I have as well. Clay built me a -5v board to hook up SDB, but I never got the balls to hook it all up. Any help or insight is appreciated. I don't have any experience here, but I just read the stuff on the website about this thing, and now I'm happy to give an otherwise uninformed opinion. 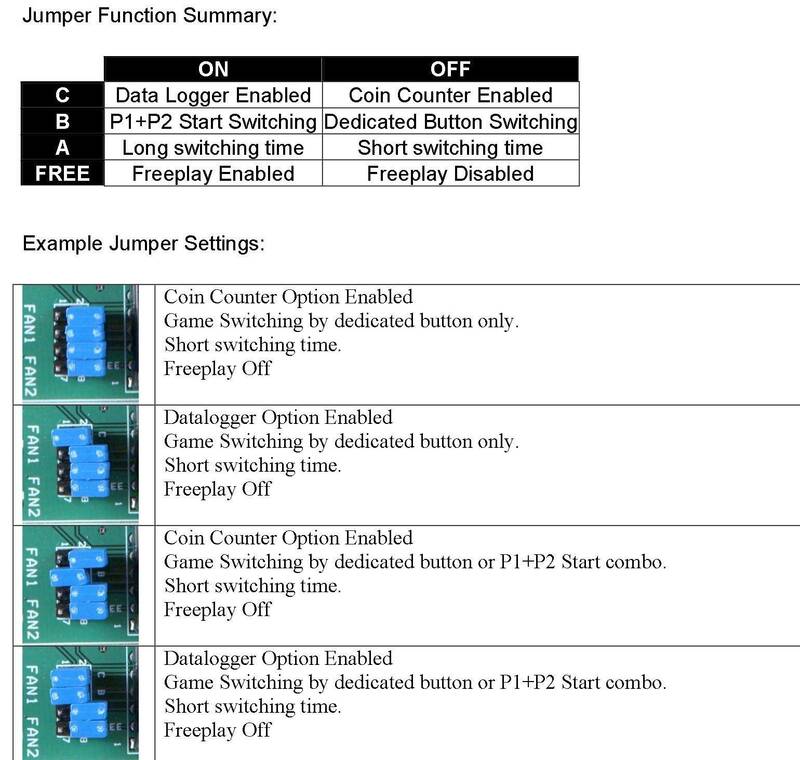 Given the description of how extra buttons are wired, and how to deal with non-button/joystick controllers (basically: hook to all boards directly, in parallel), I'm going to assume that's what the multi-jamma itself does with input buttons. This is normally perfectly fine, HOWEVER, if you get one board (board A) that read the inputs differently than the others (perhaps using different resistors for a pull-up), then the presence of board A could make board B think that something is pushed when it isn't, or perhaps making it impossible for the voltage to cross the threshold that board B needs to see to register it as pressed. Basically: There's only so much that the Multi Jamma can do, and odd choices on the part of a board designer can make the whole thing not work out when boards that were designed in isolation are put together into the same system. Now, one could design the whole setup such that the inputs from the cabinet are isolated, and replicated out to each board, but that would increase the footprint of the assembly, complicate the design, raise the price, and might make it harder to support things like track balls (depending on how they are connected). Bump, still looking for another person who might have this setup or know some one who does. Following. I am considering 3 versions of Arkanoid in one cab. I bought the parts to convert the two older boards to Jamma but am looking for a good multi Jamma board. Maybe I will have less trouble seeing as all 3 games use exact same controls. Good luck and sorry I have nothing to add that could help you. Hey, if it doesnt work out, maybe you want to buy the setup? LOL. Let me know. I tested one of these in the Smash TV at Logan Arcade (if the game is still on the floor there, it's probably still in there. I also ran it with DJ Boy/B. Rap Boys/B. Rap Boys Remix). It was running Smash & Total Carnage successfully with only a bootup glitch every now and then. It's likely that it works best with games from series as opposed to a bunch of different games from different manufacturers. I had grand plans for a multi-Konami & NBA Jam/Hangtime that I unfortunately never got to. I have a successful Clay Cowgill multijamma setup. Funny though I had problems with Tetris too. How do you have your P1+P2 start buttons hooked up to switch between games. I didn't think that was part of the original setup and wanted to do that with mine but ended up just installing a button just for that. If I were to do this again, I'd also install a button. People just couldn't wrap their heads around pressing 1+2 to switch games. I think its a jumper setting. What games are you running? Some people just put a button in place of a coin door lock. Looking over the manual the board does not have a setup for the P1+P2 to switch between games, just a switch input on the main board. I've got two setups, one i'm running Batman, NBA Jam, Rampage WT, Cue Brick, Bosconian, Soul Calibur, and Outfoxies. I've got another setup that had Smash TV and Total Carnage but am having issues with that one, might be the used jamma switcher board I bought. I've also noticed significant voltage drops over the boards, best to have the higher wattage power supplies. I was given a schematic from the KLOV forums to wire up the P1+P2, it worked kind of, but not really well. Do you have the older version maybe? Wow, yeah I haven't seen that before, all mine i've bought used off of others so there's a good chance they are older versions. Did you buy your's new recently? I bought mine back in 2014 from his site. Bump. Looking for any one with a wiring diagram of their setup to compare. I havent touched this in a long time. I may try and find an arcade guru to get my game up and running with all 8 games running. I have a few boards laying around, and I have a few in mind I would like to add. Bump. No one runs multiple JAMMA boards in their arcade cabinets??? Are you a member of KLOV? I have to believe those guys could easily answer your questions.